With a win tonight against the rival Dallas Stars at HP Pavilion, the San Jose Sharks can guarantee qualifying for playoffs. Not that Sharks fans alike have any doubt; the Sharks are one of the hottest teams in the NHL right now, with an amped defensive line and a slew of hard working forwards putting up respectable point productions: namely Logan Couture, Ryane Clowe, Joe Pavelski, and Patrick Marleau. The Sharks are currently seeded third in the Western Conference, just one point behind the Detroit Red Wings, a team that just last night suffered one of its worst losses in a 10-3 embarrassment to the St. Louis Blues – at the Joe Louis Arena in Detroit, no less. Fortunately, the Sharks have one game in hand, so with a win tonight, they can potentially be one point ahead of the Red Wings with equal games played. Since the last Sharks-related update on The San Jose Blog, the Sharks have played two games: the first against the Los Angeles Kings (resulting in a shootout loss), and against the Phoenix Coyotes (resulting in a 4-1 Sharks victory). The Kings game had been particularly exciting due to the third period scoring; more specifically a three goal outburst during the last three and a half minutes of play. As the Kings held on to a 2-1 lead for most of the game, Patrick Marleau tied it up with just 3:32 left in the third period, giving the Sharks and Sharks fans hope they could rally for a victory against the Kings. Not long thereafter, Joe Thornton took a penalty, giving the Kings a power play, and allowing Kings captain Dustin Brown to score with 1:42 left, lifting them back to a one goal lead. As the game came to a close, and with Sharks goaltender Antti Niemi pulle for the extra attacker, the Sharks executed a successful last-minute effort, with Marleau scoring again to tie the game – with only four seconds left in regulation. Although the Sharks ended up losing in the eventual shootout, Marleau’s goal guaranteed the always helpful standings point. The game versus the Coyotes saw the Sharks dominate, as usual. Niemi played extremely well, saving many hard-to-block shots, despite not having an incredibly large shot on net count. Logan Couture tallied twice, further making a strong case for himself as a top Calder Trophy contender. Ryane Clowe tallied as well, also adding a couple of assists and a fight (against none other than Twitter celebrity Paul Bissonnette @BizNasty2point0) to complete a Gordie Howe hat trick. The final score was a 4-1 Sharks victory in Phoenix. Six more games are left for the Sharks to play before the end of the season – all against other Pacific Division teams. The Sharks are currently atop the Pacific Division with 97 points, two ahead of the Phoenix Coyotes, three ahead of the Los Angeles Kings, four ahead of the Anaheim Ducks, and ten ahead of the Dallas Stars. With the Pacific Division performing so well, it’s entirely possible that all five teams could be in the top eight by the end of the season – a rare feat, no doubt, but incentive for the Sharks to never stop playing well. 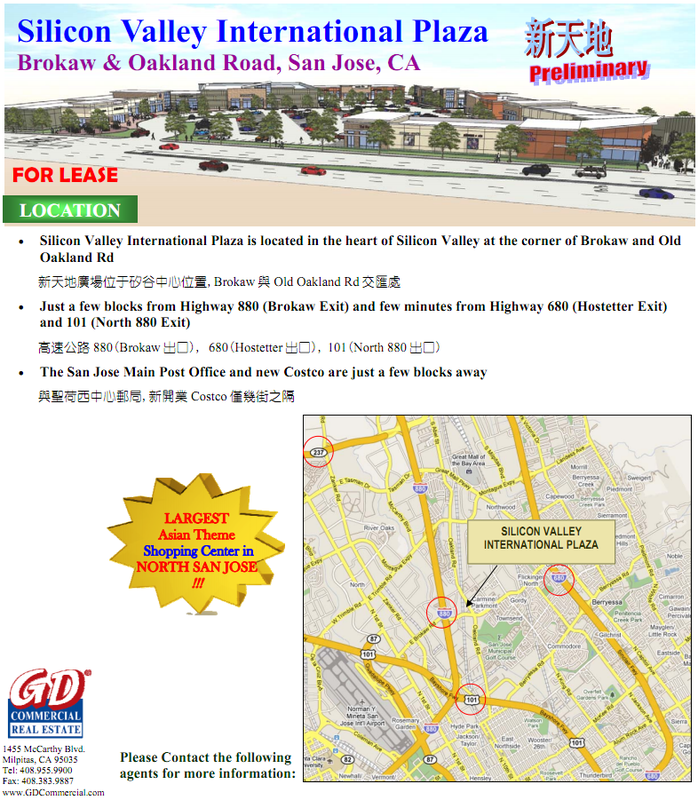 The Silicon Valley International Plaza is coming to the corner of Brokaw and Old Oakland road (next to Costco) and will feature over 100,000sqft of Asian-themed retail. The main anchors will be an Asian supermarket and a dim sum/seafood restaurant, but based on the photo below I'm expecting a lot of restaurants. Thanks to xThomasTroublex from the San Jose Development forum for the info. You can find more details on this project right over here. What would you like to see? Please post your ideas in the comments! Another high-rise open house is coming to Downtown San Jose in just 2 days. There will be plenty of food from The Mmoon, Loft Bar and Bistro, and Mezcal! In addition, there will be pedicabs that will transport you for free from high-rise to high-rise. If you make it to all 3 venues, then you'll be entered into a raffle to win gift certificates for Ballet San Jose, Tova Day Spa, La Pastaia, Zanotto's, Lost Gatos Brewing Company, Satori Tea, and Andy's Pet Shop. You can register for the event right over here. Based on the trailer and press release below, this looks like one of the more interesting IMAX movies to come to The Tech in quite some time. I'm looking forward to this one. SAN JOSE, SILICON VALLEY, CA. – Join IMAX and Warner Bros. Pictures on a miraculous journey of second chances when Born to be Wild opens April 8 in The Hackworth IMAX Dome Theater at The Tech Museum. Follow young orphaned elephants and orangutans on the trip of a lifetime, from birth to rebirth, on the vivid screen of the nation’s second largest dome theater. This family friendly documentary transports moviegoers to the far stretches of Kenya and Borneo and inspires them to take action to save Earth’s precious creatures. Narrated by Academy-Award winner Morgan Freeman, Born to be Wild is an inspiring story of love, dedication and the remarkable bond between humans and animals. Stunningly captured in The Hackworth IMAX Dome Theater - with its crystal clear images up to eight stories high and 13,000 watts of wrap-around digital surround sound - Born to be Wild is a heartwarming adventure that takes moviegoers into the lush rainforests of Borneo with world-renowned primatologist Dr. Biruté Mary Galdikas, and across the rugged Kenyan savannah with celebrated elephant authority Dame Daphne M. Sheldrick. For information on tickets and show times, call (408) 294-TECH (8324) or visit the website at http://tickets.thetech.org/production/imax.asp. Supreme Dog at 284 S. 11th St.
House of Bagels at 505 E. San Carlos St. It looks like San Jose is the #1 city for expected increase in home values for 2011 based on a Forbes article. I like how they used a photo of Rivermark in Santa Clara for the article... close but no cigar. Here's the link. Thanks to DLo for the tip. Check-out the new limited edition Frances Marin tee (20 pieces printed)! Have some drinks and goodies in the back room! Interesting survey results from San Jose Bike Party participates. As soon as a bike sharing program comes to San Jose, I'm going to join the next run! Bike Party’s goal is to build community through bicycling. In order to determine if we are achieving our goal, we surveyed our riders and participants. Over 500 participants responded to a self selection survey. (We posted in on the website and sent it out to the facebook group). These are the results (with 585 completed). 76% of riders have made friends because of Bike Party. The San Jose Sharks are in a great position right now: first place in the Pacific Division, third place in the Western Conference (only one point behind the Detroit Red Wings), and currently riding the momentum of a four game win streak. Additionally, today's main roster is full of healthy players (with the exception of Scott Nichol, currently on injured reserve) ready to take on the post-season. All-star defenseman Dan Boyle recently made a return after missing several games due to an upper-body injury, and talented rookie Logan Couture had been able to play the very next game after suffering an ugly spill into the boards during the Sharks’ game versus the St. Louis Blues. Many feared Couture would be out indefinitely due to his difficulty leaving the ice, although reports confirmed, in addition to Couture himself confirming on his Twitter account, that his injury was not as bad as expected and he would return for the very next game. Not only did Couture return, but he did so with flair, scoring another goal to contribute to the Sharks’ 6-3 victory over the Calgary Flames last night. For the rest of the season, the Sharks will be pitted against their tough Pacific Division rivals: two games against the Los Angeles Kings, three games against the Phoenix Coyotes, one game against the Dallas Stars, and two games against the Anaheim Ducks. The Sharks by no means have their first place position in the Pacific Division clinched, especially since their Division is, by far, the strongest performing in the Western Conference, with four out of the five Pacific teams currently in the top eight. Fortunately for the Sharks, their current year acquisitions have all been big winners, each performing well: Ian White stepping up as a tough offensive defenseman, Kyle Wellwood as another Scott Nichol-type hard working player, and Ben Eager as a solid checking line player not afraid to use his size to his advantage (as many of us remember from last year’s playoffs when he was playing on the Chicago Blackhawks). The Sharks’ scorers have also been performing. - Patrick Marleau, after not scoring for much of the season, has had a recent point-scoring burst, hitting the 30-goal mark for the season during the game against the Flames last night. - Joe Pavelski has displayed his masterful ability to set up plays, similar to teammate Joe Thornton. -Fan favorite Ryane Clowe, the gritty corner master and enforcer, is very close to hitting sixty points already for the season (as is Dany Heatley). - Veteran defensemen Douglas Murray, Marc Edouard Vlasic, and Jason Demers have been handling the blue line well, keeping standout netminder Antti Niemi well protected from wayward pucks. Niemi has also been doing well in his own right, now being particularly famous in San Jose for his ability to see through screens to make amazing saves. To give a proper “shout out” when it is due, based on last night’s game, I would like to congratulate on Torrey Mitchell’s two-goal game and to Mr. Number 69 Andrew Desjardins for his first NHL goal. The Sharks play the Los Angeles Kings TONIGHT at the Staples Center, the start of the Sharks’ eight game campaign against familiar Division rivals. Let us hope the rest of the season goes well for the Sharks so a favorable playoff spot can be clinched! A Silicon Valley legend takes the stage a week from today to promote his latest book: The Art of Changing Hearts, Minds and Actions. If you are an entrepreneur or are currently dreaming of starting a company someday, you need to be at this event! Guy Kawasaki is the ultimate guru for starting companies in the valley. His books provide you with realistic expectations and guidance based on his vast experience--starting way back when he was the key evangelist and marketer for the original Apple Macintosh. For anyone looking to start a Silicon Valley company, this will time very well spent. The full press release is below. As a side note, Guy also runs one of my favorite blogs... How to Change the World. This site is entertaining for anyone, even non-entrepreneurs! Chamber of Commerce International Consortium for Entrepreneurs (CCICE) welcomes Guy Kawasaki on Tuesday March 29th at the Computer History Museum in Mountain View, CA. Guy Kawasaki will be speaking about his tenth and latest book, “Enchantment: The Art of Changing Hearts, Minds, and Actions”. This is a rare opportunity to hear Mr. Kawasaki along with Jenn Lim, Chief Happiness Officer for Zappos and Kate Bennett Eriksson, Ericsson Head of AT&T Innovation Centre, speak at the iconic center of Silicon Valley, the Computer History Museum in Mountain View. In Guy Kawasaki’s push for innovation he continues to motivate entrepreneurs to get creative and enchant partners, customers, clients, teams and more. In his latest book, Guy explains how to influence what people will do while maintaining the highest standards of ethics. The book explains when and why enchantment is necessary and then the pillars of enchantment: likability, trustworthiness, and a great cause. ”Enchantment” subsequently discusses: launching, overcoming resistance, making enchantment endure, and using technology. There are even special chapters dedicated to enchanting your employees and your boss. Finally, because there are times you may want to resist enchantment, there’s even a chapter about how to do this. 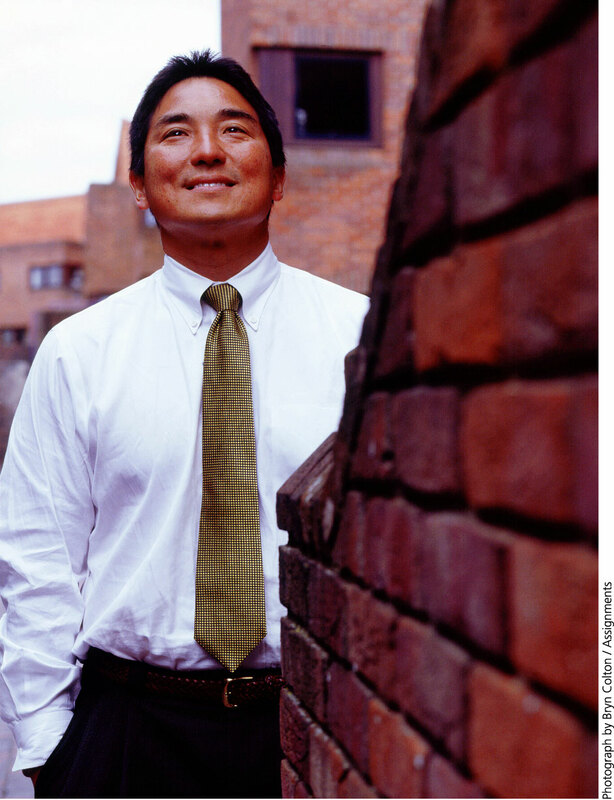 Guy Kawasaki is a managing director of Garage Technology Ventures, an early-stage venture capital firm and a columnist for Entrepreneur Magazine. Previously, he was an Apple Fellow at Apple Computer, Inc. Guy is the author of nine books including Reality Check, The Art of the Start, Rules for Revolutionaries, How to Drive Your Competition Crazy, Selling the Dream, and The Macintosh Way. He has a BA from Stanford University and an MBA from UCLA as well as an honorary doctorate from Babson College. It's time for yet another contest! This time for one of San Jose's newest performing arts venue, and a place that I've been meaning to check out for some time now, The Retro Dome! What was once Century 25 near Westgate is now home to musical theater, retro film, live music, and comedy. We're giving away 2 tickets to their latest production, Xanadu. Despite being based on a bad 80s movie, the Broadway version has become a smash hit, winning multiple awards and a Tony nomination. This is the very first time Xanadu is being performed in the Bay Area. To win your free tickets, email your favorite San Jose memory from the 80s to josh@thesanjoseblog.com. If you weren't alive or can't remember the 80s, then ask your parents or friends. Feel free post your memory in the comments as well. I'll share some of the best ones at the end of the contest. Rock Climbing is Coming to SoFA! Let's start off the week with some good news. The remnants of Club WET in SoFA will soon become a 14,000 sqft Rock Climbing Gym called Touchtone. WET was frequently wrought with issues--such as fights and a few stabbings--that I think created a negative perception of the area. I'm pretty confident this will be a better use for the space and hopefully they can incorporate a little artsy SoFA character into it. By the way, there used to be a Touchtone in Downtown San Jose. It was right next to Camera 12 and had what might have been the smallest rock wall in existence. No, seriously it was maybe 10 feet tall. I had to chuckle at it every time I walked by. The new SoFA Touchtone won't have that same problem as the climbing walls will be at least 35 feet tall. Christmas in The Park is being planned for 2011, but the organizer needs to replace $370,000 of funding that used to come from the city. The city has developed a master plan for the area around Diridon Station incorporating 5 million sqft of office space, 420,000 sqft of retail, 2,600 residential units, 900 hotel rooms, and an underground train station. CJ's Cafe and Catering at 303 Almaden is under new ownership. Us Studio Hair Salon is now open at 54 W. Santa Clara and also features vintage and custom designed clothing. Team San Jose and Groundwerx have come to the rescue of two downtown Heritage clocks that stopped working. They are now operational again. Want the scoop on next week’s San Jose Dishcrawl? On March 23rd food lovers will gather once again to roam about downtown tasting food with exotic twists. Tikka Bytes Food Truck – known for their authentic Indian street food dishes like pani purr. – I saw them at Edgewood Eats the other day but only glanced at their menu since I knew they’d be at Dishcrawl. I can’t wait to try their food, it looked and smelled so good. Satori Tea – Who knew there was a tea bar in San Pedro square? It is totally hidden. Looking forward to trying something new. I’m not a big tea drinker but that’s only because I don’t know what I’d like! Anyone else feel the same way? This is yet another great reason for an event like Dishcrawl. And now announcing two other stops! Morocco’s Restaurant – fresh culinary delights of Moroccan cuisine. LilPuffs.com – Gourmet marshmallows! They come in six flavors: Strawberry Raspberry, Mango, Passion Fruit, Pineapple and Chocolate. I’m crossing my fingers that we get to try the pineapple one. Someone from LP will be handing out fluffy delicious marshmallows to the Dishcrawl crowd. If you were at one of the previous Dishcrawls the crowd started at one of location. Food and/or drinks are served as the crowd mingles with each other. The owners of the establishment (or chefs) talk to the crowd about the culture of the food. It’s a really great experience for people who want to learn just a little bit more about different cuisines (or uniquely crafted food.) After the first location, it’s time to move on to the next! There’s a twist to next week’s Dishcrawl that will change it up a bit. So there you go San Jose – what are you waiting for? Go get your tickets now before it’s too late! IMPORTANT MEETING ON THE FUTURE OF ST. JAMES PARK! It’s time to talk about “next steps” and other issues at St. James Park! Council member Liccardo and a PRNS representative will be present to hear comments, concerns and suggestions regarding the future of St. James Park. Please spread the word. SPECIAL OFFER: Throughout March, mention White Road Films or sjdowntown.com to receive a free cup of coffee with the purchase of two pastries. We personally believe in this boulangerie. Bakery in a city in Alsace named Colmar. the community where her mother was also born and raised. first bakery here in the heart of the Silicon Valley! items. And bring a friend! Step 1: Call (408) 277-3208 and sign up for one of the meeting locations listed below. 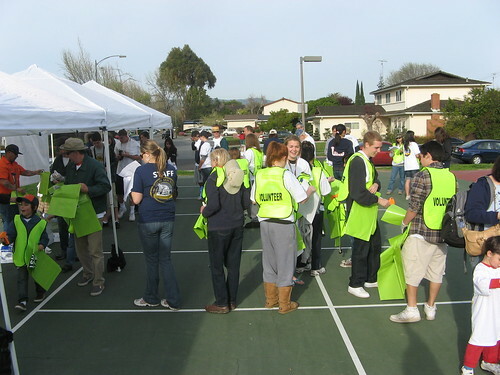 Step 2: On the day of the event, register at your meeting location and receive litter clean-up supplies*. Step 3: Following the event, join us for a Celebration Lunch at your Council District’s Event Kickoff Location. Lunch is free for volunteers. -Roosevelt Center, 901 E. Santa Clara St.
-Washington United Youth Center, 921 S. First St. If you are interested in participating please follow directions above…Of course you can choose either of the location because this is for DOWNTOWN! * Donated supplies are limited. Volunteers are encouraged to bring their own pick-up stick and gloves. Of course you can choose either of the location because this is for OUR DOWNTOWN! 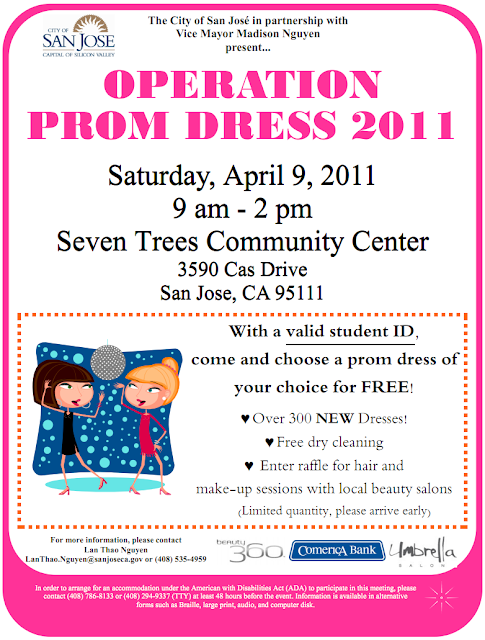 Since 2008, Operation Prom Dress has given away over 1,500 dresses to young women across San Jose that are unable to afford one on their own. The event is hosted by the City of San Jose and Vice Mayor Madison Nguyen. This is a fantastic way to ensure that everyone has a chance to attend their prom, a once or twice in a lifetime event. If you know anyone that would be interested in attending, please spread the word!